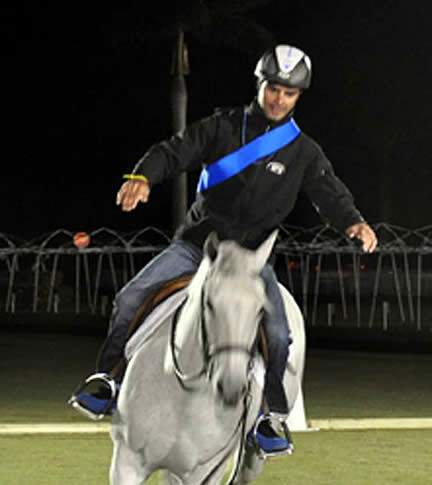 Rodrigo Pessoa at the 2010 Fete Cheval to benefit The EQUUS Foundation. Photo courtesy of The EQUUS Foundation. WELLINGTON, FL – March 7, 2011 – It’s a sell out for dinner, but performance seating is still available for the Fete Cheval to benefit The EQUUS Foundation and presented by Foundation Farm, which will be held on Friday, March 11, 2011, at the Palm Beach International Equestrian Center in Wellington, Florida. Performance seats are $100 per person and include an open bar and great entertainment! One lucky winner of the Fete Cheval Rider Raffle will have the opportunity to ride with professional riders, Max Amaya, Pablo Barrios, Derek Braun, Molly Ashe Cawley, Nick Dellojoio, Mario Deslauriers, Hillary Dobbs, Sandy Ferrell, Brianne Goutal, Patricia Griffith, Charlie Jayne, Darragh Kenny, Laura Kraut, Kate Oliver, Rodrigo Pessoa, Kim Prince, Havens Schatt, Louise Serio, Shane Sweetnam, Jimmy Torano and McLain Ward. Raffle tickets at $100 per ticket will be on sale at the event. The winner must be a guest at the event, and wear appropriate riding attire for the games, including a riding helmet. The International Club will be closed for the evening to focus all the festivities in the Special Events Tent, where, prior to the games, a cocktail reception, auction, and dinner will be held starting at 6:00 p.m.
USEF and The EQUUS Foundation Team Up to Play Favorites; Can You Help? February 25 2011 – Lexington, KY – Who is the most beloved equestrian athlete in America? The clock is ticking. The buzzer sounds. Can you prove it? Actually, you can. All it takes is a $5 gift to The EQUUS Foundation and you’ll be able to “play favorites” in the nationwide fundraising effort “America’s Favorite Equestrian.” The EQUUS Foundation and the United States Equestrian Federation (USEF) jointly launched the charitable mobile texting game in celebration of the 2010 Alltech FEI World Equestrian Games and the eight international disciplines represented on the field of play. 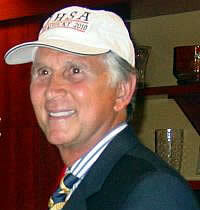 WELLINGTON, FL – January 9, 2011 – Bob Cacchione, Executive Director of the Intercollegiate Horse Show Association (IHSA), will be honored as the recipient of The EQUUS Foundation Humanitarian Award presented by The United States Equestrian Federation (USEF). The presentation will take place on January 21, 2011, at the USEF Pegasus Awards Dinner during the Federation’s Annual Meeting in Lexington, KY. The EQUUS Foundation Humanitarian Award is a celebration of the humanitarian achievements made by a member of the equestrian world. Specifically, the goal of this humanitarian honor is to spotlight and exalt the selfless dedication one individual or a group of individuals has made, whether on a regional or national scale. From improving the health and welfare of the horse to promoting and expanding the general public’s appreciation and respect of the diverse roles of horses, the recipient of this award will be someone who has devoted considerable personal time to making the lives and quality of life of our equine partners paramount. 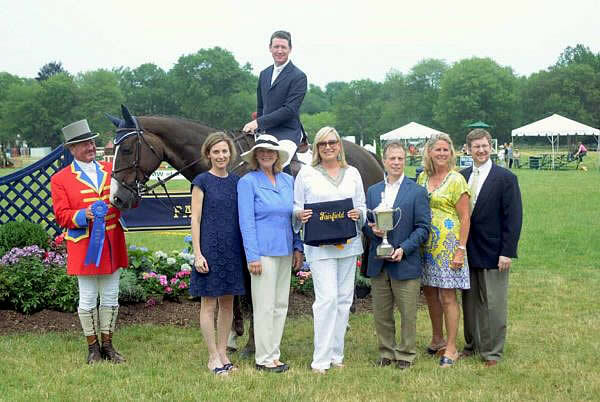 Vocas, owned by Louisburg Farm and ridden by McLain Ward, winner of the $25,000 Fairfield Grand Prix and the Callari Cup presented by Wells Fargo Advisors. Photo courtesy of Reflections Photography. WESTPORT, CT – June 29, 2010 – McLain Ward, aboard Vocas, owned by Louisburg Farm, emerged victorious over a field of 27 competitors at the $25,000 Grand Prix on Saturday, June 26, 2010, the culminating event of the Fairfield County Hunt Club June Benefit Horse Show held in Westport, Connecticut. Urged on by spectators and over 350 guests at The EQUUS Foundation Grand Prix Benefit Luncheon, Ward and Vocas claimed victory in an exciting jump off. Ward also placed 4th aboard Esplanade 7 owned by Louisburg Farm, and 12th aboard Miel D’Amuray owned by Gabby Slome. George N. Venizelos representing Wells Fargo Advisors was on hand to present the well-earned blue ribbon, along with Jonathan Moffly of Moffly Media, Show Co-Chairs, Alison Ashman and Catherine Herman, Jenny Belknap Kees, Chairman of the Board of The EQUUS Foundation, and Lynn Coakley, President of The EQUUS Foundation. WESTPORT, CT – May 10, 2010 – The EQUUS Foundation received a $25,000 grant from Newman’s Own Foundation to support its mission to educate the public about horses; provide financial support through the award of grants; offer insight on management and financial practices of the charities through a thorough review of their operations; and provide a network of interested individuals for volunteer recruitment.